This 9 acre parcel of land, mostly within Saluda’s City limits, was originally part of the Ransom Pace family landholdings that included from the north side of Autumn Care. This last parcel left was owned by William Pace, who lived in Hendersonville. He had not sold this piece, mostly because he did not want to sell all of his Saluda inheritance. When Alex Salley, an old friend of Mr. Pace, and a SCLT representative contacted him about the possibility of preserving it as a park and trail system, Mr. Pace was very agreeable. Polk County Community Foundation through the Bradley Fund provided 50% of the funds necessary for the purchase, and SCLT provided the other half of the purchase money. There is a spring on the property that provided water for the houses above on Esseola St. The Lazy Girl (Lazy Gal) was a pulley system used to haul the water uphill and across the road. 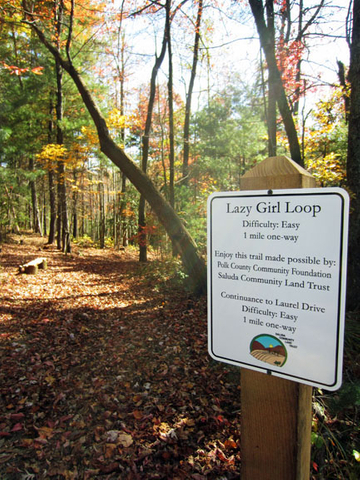 The Lazy Girl Trail encircles that spring.